The Beach is a popular new addition to Lake Farmington's offerings for family fun! A sandy beach area has been groomed for play and a large section of the lake has been roped off for swimming. Bring your own inflatables and enjoy playing on the water slides and trampoline. The area is patroled by lifeguards. Designated swimming lanes are also available for laps. Kayaks, paddle boards, water vests and fishing kayaks are available for rent onsite. The Beach will open Saturday, May 26, 2018. Hours are 12:00 to 6:00pm, seven days a week through August 12, 2018. August 13 - September 2, 2018 The Beach will be open only on Saturdays and Sundays. The last day of the season will be Labor Day Monday, September 3, 2018. There is no entrance fee for The Beach, once the daily or seasonal lake access fee is paid. The daily or seasonal fee will be collected at the main entrance from 6:00am to 10:00pm. Access after hours must be paid via the self-pay station. You may purchase season passes at the Lake Farmington Main Entrance, Farmington Aquatic Center or the Farmington Museum. For additional information on the lake access fee visit the City of Farmington website. Beyond The Beach, Lake Farmington is a popular fishing and boating spot, year-round. Species in the 250-acre lake include rainbow trout, largemouth bass, catfish and even pike. The lake is open to the public from 6:00am to 10:00pm. Night fishing is also allowed at Lake Farmington. To fish at the lake after the standard operating hours (6:00am to 10:00pm) the $5 lake access fee must be paid before gates close at 10:00pm. Lake Farmington also features a 21-site dry campground. Facilities are open year-round and include vault toilet, fire rings, grills and picnic tables. Campsites are available on first come, first serve basis. Visit Fmtn.org for additional information or call Farmington Parks, Recreation & Cultural Affairs at (505) 599-1197. 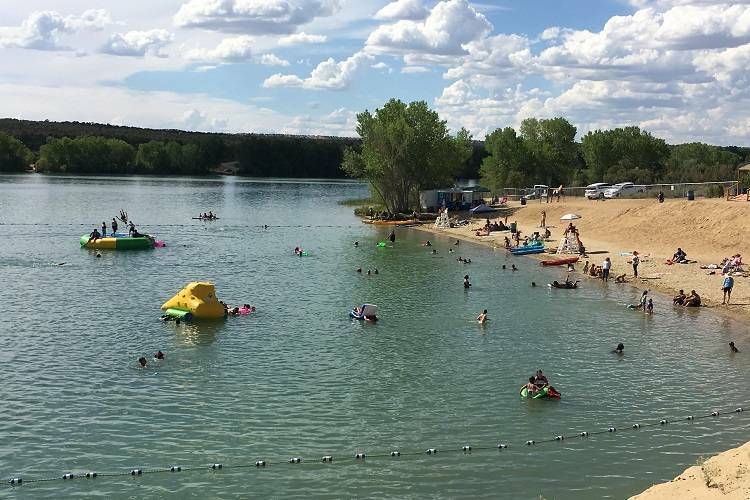 Lake Farmington, shown as Farmington Lake or Beeline Reservoir on some maps, is located east of Farmington on Main Street/NM 516, offering a fishing oasis just minutes from the center of the city. The turn off for Lake Farmington is accessed from NM 516/Main Street, across the street from the Farmington Flea Market. PLEASE NOTE: Google Maps and MapQuest list a route via Flora Vista, Road 3535 and 3544. This is an error, there is no lake access for vehicles using this route. For assistance with directions call the Farmington Convention & Visitors Bureau 505-326-7602 or 800-448-1240.